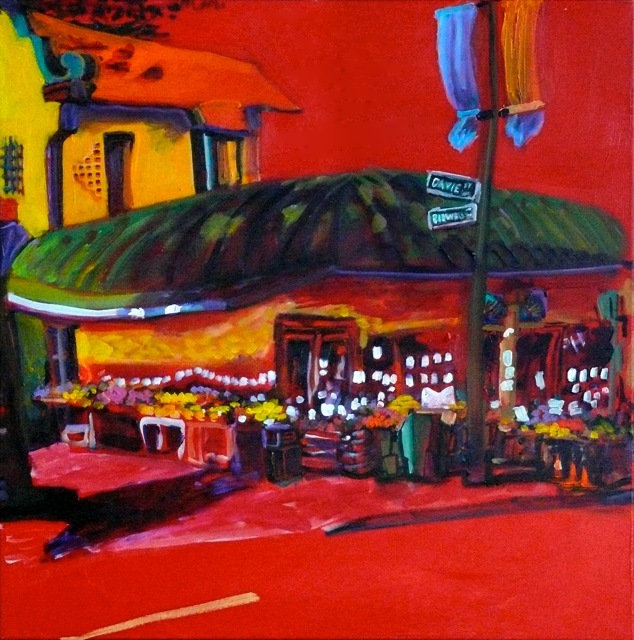 Tiko Kerr has painted a series of paintings dedicated to the heritage site Maxine’s located at Bidwell and Davie Street and to the immediate neighbourhood. Davie Street and Goliath illustrates the devastating effects of City Hall’s STIR Program. It is the first victim. Round 1: Maxine’s (Heritage Building) Bidwell and Davie Streets. 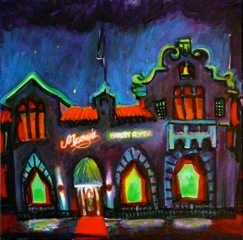 Tiko Kerr unveiled “A Night Full of Stars (Maxine’s) at 1215 Bidwell Street, 21 July 2010 (12 noon). For more information, see RELEASE, A Night Full of Stars, Tiko Kerr, West End art unveiling, WEN, 21-July-2010-1. The painting will be auctioned off to raise funds to support community participation in a West End planning process. These are some of the comments he made at the event. My name is Tiko Kerr. 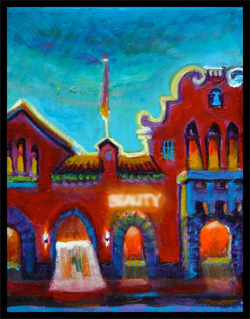 I am a visual artist and I am proud to have been a West End resident for the past 30 years. In my opinion the West End enjoys perhaps the oldest and most integrated community in the City. I have a growing concern about the politics that are affecting the direction of development in the West End, and in the entire city, in fact. We are facing enormous pressure to accept rapid and dramatic changes to our neighbourhood. There has not been enough consultation with the community about our choices or the costs and benefits of these changes. I am not alone in my reservations. I have discovered many thoughtful and intelligent residents that share these concerns and together we have formed a grass-roots organization called West End Neighbours. We hope that everyone in the community can work together to discuss and create our shared future. One of the core problems facing us is the STIR program that allows the City to override good planning to implement “radical” rezonings and build buildings that are out of character with the neighbourhood. Meanwhile, many of our other community needs have not been addressed. There has been a breakdown in trust between the community and City Hall, and the cards are heavily stacked in favor of City Hall and developers. It’s time for the community to have a say in its destiny. That’s why I felt compelled to get involved. One of our West End treasures is Maxine’s at 1215 Bidwell Street. Vision Vancouver pushed through the rezoning of this site to build a 21-storey tower. The businesses operating had to be out by July 31, 2010. If the tower is built here as planned, only the façade of Maxine’s will remain under an imposing 21-storey tower. There’s a lot more that’s wrong with this project. The main parts of this deal were made between the City of Vancouver and Millennium Development behind closed doors. As residents we are not against change and development in the West End. But we are definitely against any sort of development happening without adequate community participation. I have created these painting that celebrates the integrity of our West End Heritage to add some weight to our group’s aims of encouraging the city to slow down the development process so that the ramifications can be closely examined and that a community process can be established that will allow West Enders to participate in the planning of the Maxine’s site as well as the other sites slated for major construction projects. We have created t-shirts and buttons with the these images and encourage people to purchase and wear them in support of our neighbourhood.